Monday, March 5, 6-8pm. Cake pops are made by crumbling and compressing a baked cake until it is smooth and fudge-like in consistency. Then it is molded into fun shapes or balls, covered in chocolate or candy coating and served on a stick. With a full selection of flavors, and a variety of ice cream sundae-like toppings, Laura’s cake pops bring a creative and delightfully tasty flair to any event or gathering. Now YOU can learn how to make them!! Everything will be provided for you; just bring something to carry them home in. $18 per person or $30 for two people. Children are welcome with an adult. Preregistration required: 1stlu.org/baking. Graduates: You and your parents/guardians are cordially invited to mark the milestone of your graduation at First Lutheran’s High School Graduation Recognition Dinner on Sunday, March 11, from 6-8pm. RSVP to the church office by March 4: 608.783.2236 / office@firstlu.org. Sunday, March 25: Fundraiser for youth going to National Youth Gathering, mission trips and Bible camp. No coffee hour nor Sunday School between services. Breakfast will be served 9–10:30am. 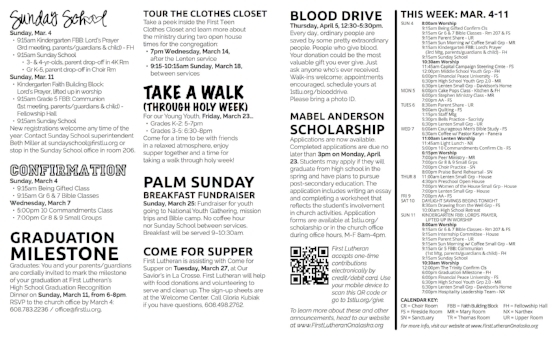 First Lutheran is assisting with Come for Supper on Tuesday, March 27, at Our Savior’s in La Crosse. First Lutheran will help with food donations and volunteering to serve and clean up. The sign-up sheets are at the Welcome Center. Call Gloria Kubiak if you have questions, 608.498.2762. Applications are now available. Completed applications are due no later than 3pm on Monday, April 23. Students may apply if they will graduate from high school in the spring and have plans to pursue post-secondary education. The application includes writing an essay and completing a worksheet that reflects the student’s involvement in church activities. Application forms are available at 1stlu.org/scholarship or in the church office during office hours, M-F 8am-4pm. Registration Now for Summer at Sugar Creek!